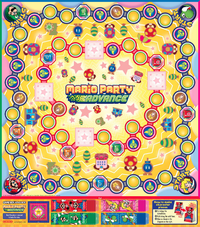 The Bonus Board is a board game that came packaged with Mario Party Advance. It can be played with up to four players, with the goal being to collect a single Star, which wins the game. It requires cutting out the paper board from the manual, cutting out the character pieces and Star Piece from the board, and using the game to roll a die, play a Gaddget, or get a chance at collecting a Star. Though the manual encourages players to create new rules themselves as they see fit, it does come with some baselines: players move around the board in an attempt to collect a Star, which can be placed on one of the four Star Spaces on the board. When a player lands on the space with the Star Piece, they can open one of six boxes in the video game, with one of them holding the Star. If they open an empty box, their turn ends; if they find the Star, they win the game. This page was last edited on March 22, 2018, at 17:37.